"Shane is an absolute professional and expert in pet training. He is extremely patient and knowledgeable. I highly recommend his services." "Shaine called within ten minutes of my Home Advisor request. He answered my email questions promptly, arrived on time, and did a great job installing the electronic fence on a sizable backyard. He was knowledgeable and patient when starting the training with our dogs. Shaine is professional and efficient but friendly and easy to work with." "Very professional and courteous as well as punctual. Great communication too." "Overall a good experience. Very professional and satisfied with the job." "Was knowledgable, friendly and did a great job!" "Shane did a great job explaining what was wrong with my system, how he was going to fix it, and what to expect. He found the break in the line quickly and repaired the break with better wiring. He even repaired the breaks I had created while trying to fix the problem myself. In addition to a speedy fix, he gave me a tip on a great place to replace my surge protector." "Prompt service. Followed up next day to be sure there were no further issues. Will use again." "Arrived quickly and quickly diagnosed the problem." "Excellent price. Did what he said he would do when he said he would do it. Have recommended to numerous other dog owners. Good company to work with." "Great job and responded in minutes." "We are very happy with the service. Very efficient and knowledgeable"
"Well equips with tool and supplies. One visit took care of my repairs." "Shawn was great, responded immediately. Fixed the issue in less than 10 minutes." "The work was completed quickly and professionally." "Shane was very professional, provided great genral information regarding dog training and promptly returned our call to answer some questions after installation"
"I called every dog fence company I could find in Middle TN trying to find the best price/quality. I have paid a lot of money before with fence problems only to have the same problem come back in 2 months. Pet Fence of Midd TN was a complete pleasure to work with and very insightful on fixing my problems now and advising me future plans to help keep my dog safe. The price was very reasonable and I would absolutely recommend Pet Fence to friends. The only thing I would change about this experience is I wish I would have contacted Pet Fence first instead of wasting a day calling so many other companies first!" "Scheduling was easy and he was on time. He completed the job quickly and was very knowledgable." "Fast, courteous, professional. This indepenently-owned company is capable of handling needed fence repairs." "One of the best subcontractors that we have worked with since we moved to the Nashville area! Shaine showed up on time, completed the job in a few hours, and took care to leave the yard looking nice. His prices were very reasonable as well. I would definitely use Pet Fence of Middle Tennessee again!" "Shane was on time, professional, pleasant and fixed the problems (I had three breaks as the result of lightning strike) quickly, efficiently and at a reasonable cost." "Shaine Robbins is great. He is very helpful and availible if you have questions when it comes to training your dogs or anything that comes up." "so far so good. very cooperative and nice to work with. could possibly have used a little more training, but working so far"
"Shane Robbins was awesome and extremely smart; a consummate professional. Its amazing, I have a corner lot, approx 1.75 acres and two maltese dogs. Shane taught me not only about how to use the fence but also how to train and discipline the boys. Its been 2 weeks and the boys have been tested many times with other dogs and people walking in the neighborhood without exception the boys have stayed on the property. Even the neighbors are commenting on how good they are by not leaving the yard anymore. 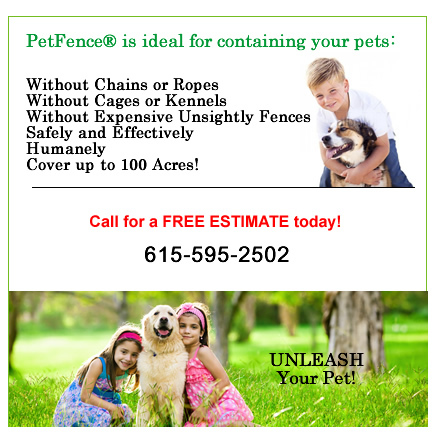 I highly recommend Shane's business - Pet fence of Middle TN." "I like the fence fence my dog likes the fence." "He was fast and thorough"
"Best service ever; I would recommend to anyone in Mid TN"
"From start to finish the job was excellent. The results was even more fantastic in that he has held two labs inside the compound when a six foot dog run wouldn't hold them before. Delivered the product on time and at a very reasonable cost. I would not hesitate to recommend the product or the installer what so ever. Totally satisfied." "Shane was professional and polite. He did a great job explaining how the equipment worked so that I could use it properly. He asked questions and listened to understand exactly what I needed. He worked with my dogs once the fence was installed to show them where the boundaries were. He also took the time to make sure I understood the importance of the training process. He made it clear that he was always available to answer any questions about the equipment or the training. I wouldn't hesitate to recommend him to anyone needing this service." "Shane did excellent work and was great with our dog." "Professional, prompt and very helpful, I would recommend this company above all other pet fences services in the great Nashville area."